I love interiors. 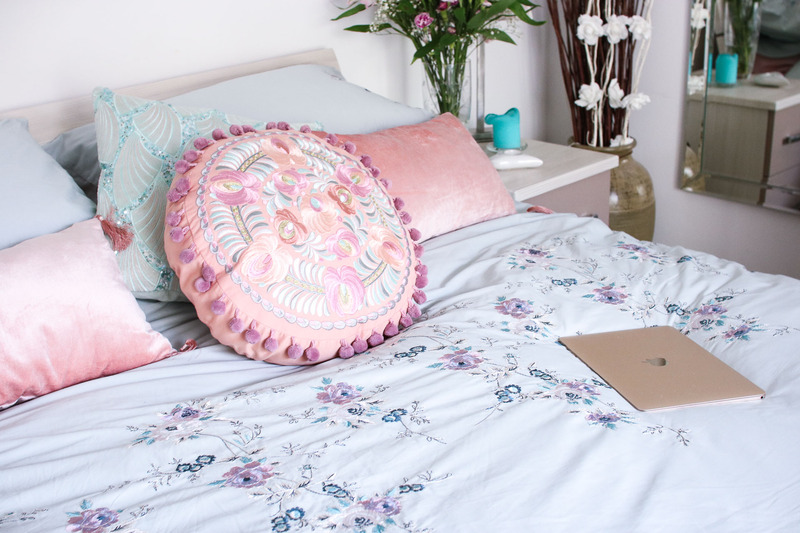 I always have – I remember getting so excited looking at homeware with my mum when I was younger and having so much fun re-decorating my bedroom. Nowadays, I have my own flat with my boyfriend and so I don’t have the same autonomy when it comes to the decoration of my bedroom. I live with a boy and so florals, pink & all other girly things have to be toned down a bit so that he can feel comfortable in the space as well. 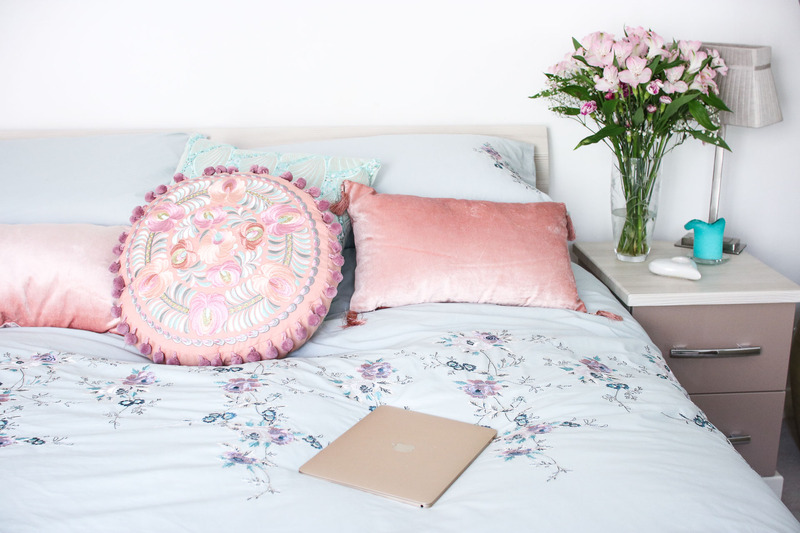 However – back in my bedroom at home with my parents, I’m allowed to do what I want and so I’ve made way more on the girly side than my bedroom in my flat. Bedding. Pink Tassel Cushions. Mint Embellished Cushion. 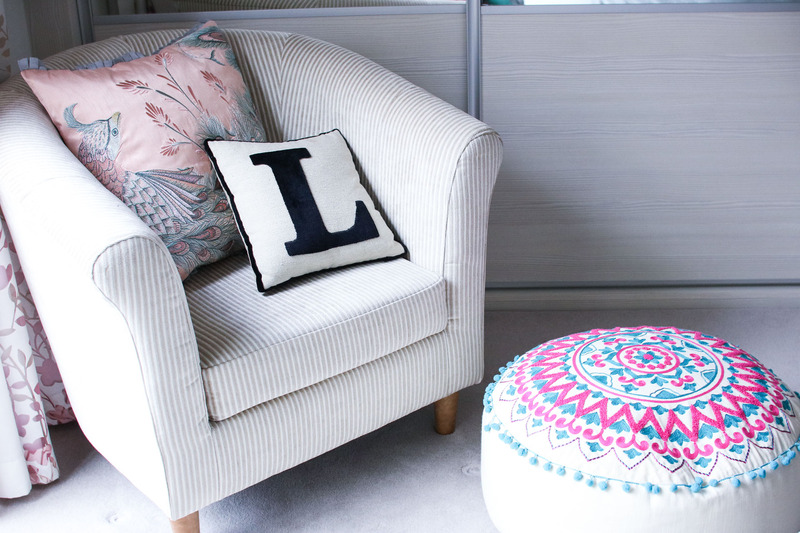 Round Embroidered Cushion. 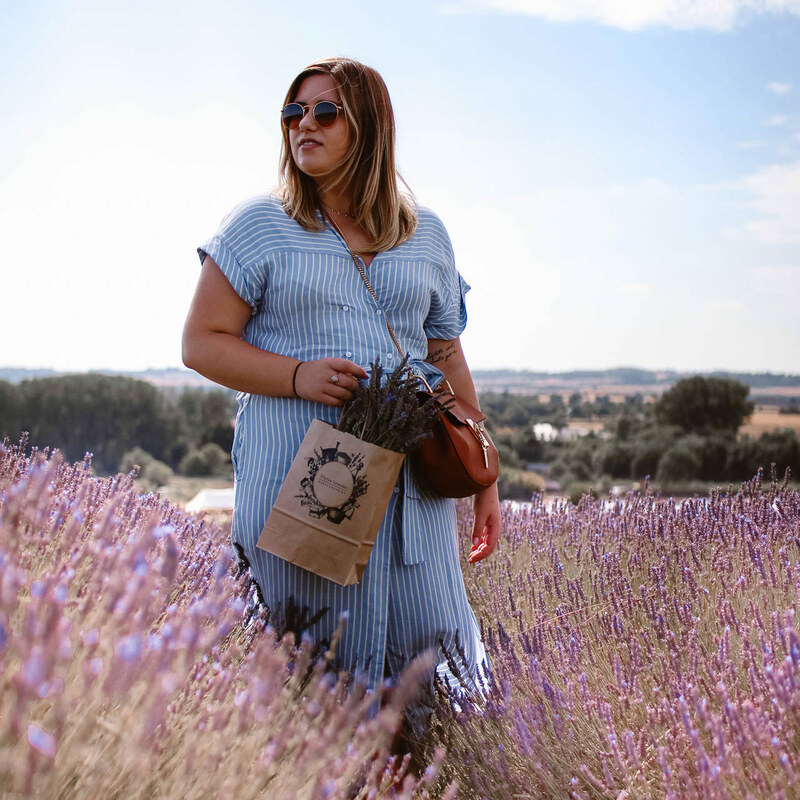 Recently I have been absolutely loving Marks & Spencer’s homeware – I think its reasonably priced, good quality but also very trend-driven as well. I picked up all of the bedding in the photos above (links included below the picture!) from M&S, but I have to say it was a difficult decision as there was just so many pretty bedding sets to choose from. I decided on this duck-egg blue set with some pink sort of opulent cushions on top – not normally what I would choose, but I did feel like my all white and grey bedroom needed a little bit of a lift. I absolutely love experimenting with interiors as I feel like, as a blogger, I can get stuck in the same rut with simply following trends. Whilst I still absolutely love copper, marble & white I am starting to move away from them a little bit. It’s nice to try new things and I am always looking for more inspiration – check out my pinterest for my plethora of interiors photos! I picked up this little pouffe from Asda – at only £25 which I think is a bargain! Again, it just adds a little bit more colour to my bedroom and also makes for a very comfortable foot-stool. This peacock cushion on the chair is also a new addition, from Marks & Spencer. I think it is just so pretty and ornate – also it makes this neutral coloured chair far more interesting. 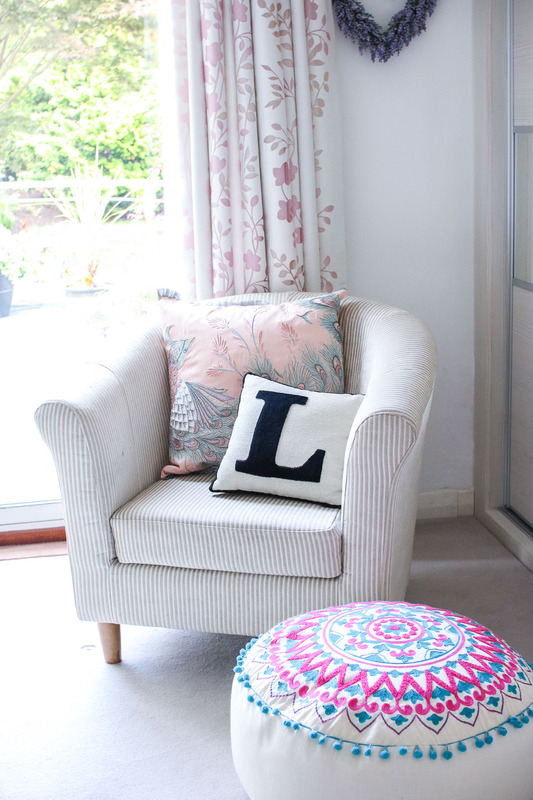 The L cushion is an older purchase, which I’m afraid is no longer available! However there are a lot of similar options on the market at the moment, initials just seem to be popping up on everything nowadays – and I’m a fan! That concludes my little interiors update in my home bedroom, but do expect a lot more interiors posts to come! My boyfriend and I have been updating our new flat for the past few months but it is really starting to come together now. I’m currently on the look-out for some artwork/prints for the walls, but everything I like has to be sent from America & the sizes over there are just impossible to find frames for! So if anyone has any recommendations for European artists or shops, I would greatly appreciate it if you left them in the comments. Preparing the home for Christmas. "Apple & Cinnamon Baked Oats"